The horror of the attack on the Charlie Hebdo magazine – the murder of 17 people – journalists, policemen, and ordinary shoppers – by Wahhabist Islamist fanatics in Paris on January 7-9, 2015, highlights the stark threat that religious fanaticism poses to Western civilization. The perpetrators of this barbarism have thankfully been eliminated due to the concerted, decisive, and careful work of French police, who managed to destroy the murderers and hostage-takers without harming or terrorizing innocent, peaceful civilians in the process. But unless the Western world resolutely affirms the untrammeled right of free expression of ideas, the already commonplace heckler’s veto over speech will turn into the murderer’s veto. Anything but complete, unconditional condemnation of this attack allows the murderers and thugs to win. Anyone who claims, “I condemn the attack, but…” is blaming the victims and suggesting that any provocation, any motivation is capable of forming an acceptable causal connection between peaceful expression of ideas and murder. For those who resolutely defend the Western values of individual rights and secularism, the only question should be, “Does the expression of a viewpoint ever, under any circumstances, justify the death penalty?” If the answer is a resounding “No!” – as it should be – then there can be no “but…”. The Western values that developed over millennia of philosophical evolution and finally emerged brilliantly during the 18th-century Age of Enlightenment are universal human values – affirming human dignity and decency, the potential for peaceful cooperation among diverse viewpoints, the superiority of the creative mind over brute force, the potential for the human condition to be elevated through reason and persuasion, not intimidation. The Age of Enlightenment tamed Christianity in the West, turning it from a religion of bloodthirsty Crusaders, superstitious witch-hunters, and intolerant inquisitors, into a relatively soft cultural force that, at any given time, largely echoes the prevailing moral climate some thirty years prior. Christians who have been influenced by the Enlightenment – and even those who reject it, who have nonetheless found it necessary to adapt to the world it shaped for over two centuries – accept, with the exception of a fringe of fundamentalist fanatics, the basic preconditions for life in a civilized society, including the respect for the political, economic, and philosophical freedoms of those who think differently from them. The Islamic world still awaits its own Age of Enlightenment, though some Muslims have, to their credit, accepted the Western Enlightenment as their own or attempted a courageous modernization of Islamic theology. Those Muslims who say “Je suis Charlie” are my allies, and I wish to see more Muslims embrace this attitude. But they have an uphill battle to fight – not just against their fanatical co-religionists, for whom no human life is sacred, but against the purveyors of postmodernist political correctness in the West, for whom the avoidance of giving offense trumps the necessity of standing on principle when the stakes are high. And the stakes are high indeed: if the murderer’s veto can result in any idea becoming inexpressible due to self-censorship and pressure from the “reputable” elements of society, then it does not matter what laws or constitutions say. If a sufficiently large element of society exists, whose members have a hair-trigger for offense and will kill you if you infringe upon their arbitrary taboos, then freedom of speech becomes a legal fiction, and de facto blasphemy law is the reality. The best protection for freedom of thought is its frequent and prominent exercise by as many people as possible. Had prominent newspapers and magazines given frequent circulation to the wittily and refreshingly irreverent cartoons that Charlie Hebdo produced – which does not, by the way, rule out also publishing critiques or rebuttals from any other peaceful perspectives – then the murderous quartet that planned the Paris attacks would have had trouble choosing a target. Indeed, much about Western culture and lifestyles “offends” Wahhabist Muslims today, yet we do not see Westerners being routinely shot for failing to pray five times per day, facing Mecca. Almost everything about Western science, representational art, music, and clothing is inimical to Wahhabist Islam, yet the purveyors of these ubiquitous aspects of Western life – many Muslims among them, too – go unharmed by the fanatics. If politically correct fears are allowed to marginalize any form of expression for fear that it might “offend”, then any person who dares stand up for that expression – as is that person’s inalienable right – becomes a target for those who would relinquish even their own lives in order to cow a society into submission to their twisted, progress-stifling ideology. Political correctness accelerates the transformation of rights into taboos, until nothing of importance can be said, and any act of substance, any design to improve the human condition, would involve maneuvering through a minefield of hysterical, volatile, contradictory, and irrational “sensibilities” of the offended parties du jour. So what is the solution? The elimination of the murderers themselves does not guarantee that similar murders will not recur. Indeed, the few courageous newspapers that reprinted the Charlie Hebdo cartoons have themselves become victims of threats and even an actual attack on the Hamburger Morgenpost in Germany. The solution is to resolutely reject victim-blaming, and for the prominent political, journalistic, and cultural figures of the Western world to themselves espouse the sentiments that the murderous fanatics considered so enraging. 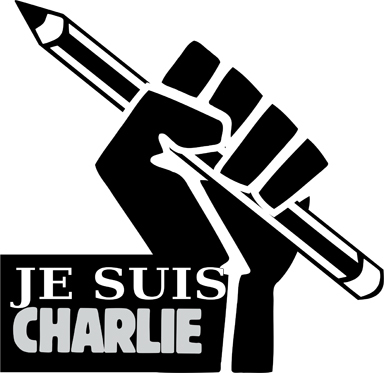 “Je suis Charlie” is a decent start, but a reiteration of the messages of particular cartoons would be far more effective. If the cartoons were republished on whitehouse.gov, parliament.uk, and elysee.fr, as well as the websites of all other national governments and publications with large readership, then a strong signal would be sent that Western societies still stand for the complete ability of any intellectual expression to occur, without its author receiving the death penalty or the kind of politically correct condemnation that invites the executioners to try. While it is not the role of governments to opine on matters of religion, it is their role to protect the rights of their constituents against infringement. Standing by the Charlie Hebdo cartoons – and similar critiques of any religion – would be a stand for the safety of anyone who would express a controversial or unpopular idea. Without a clear promise that such safety will be pursued, free speech means nothing in practice, since the expression solely of bland, prevailing, or popular ideas can occur in any society, with or without legal protections. We should be thankful to the few publications that did re-post the Charlie Hebdo cartoons – such as the Huffington Post, which presented a prominent sample here. Recognition that any individual should have the right to draw Mohammad or any other religious figure, and the choice to exercise that right or not is a purely personal matter. Finally, the alarming tendency of many long-time residents of European societies to drift toward fundamentalist Islam should be culturally combated by means of a New Renaissance of Western culture. For those who consider, rightly or wrongly, contemporary Western life to lack a sense of purpose or direction, there are far better antidotes than a murderous creed of militant fanaticism, whose spread is explained by its function as a “mind-virus” that short-circuits logical thinking and renders its carrier impervious to empirical evidence. Here, the damage done by the postmodernist critics of Western culture and its universal human values should also be reversed. In particular, the idea of progress – of the ability of humans to dramatically improve their condition through the application of reason, science, and technology – should be revived and asserted with renewed vigor in all areas of life. Beyond survival, what is the purpose of life? To achieve progress, to uplift human lives by harnessing the laws of nature to solve previously insoluble problems. The humanism of the Renaissance and the Enlightenment should be extended into its logical next phase – transhumanism: the application of science and technology to overcome age-old limits to the human condition. The deployment of the next generations of technologies – from medical breakthroughs to efforts to colonize other worlds – should occur as rapidly as possible in all fields. No amount of help is excessive in pursuing this goal, and so anyone can find meaning in contributing. While we implement such a decisive push forward along the path of progress, we should also remember that we stand upon the shoulders of giants. Great historical achievements of Western art, music, science, literature, architecture, and engineering should be emphasized and celebrated. The achievements of Middle Eastern thinkers of the early Islamic era – prior to the lapse into doctrinaire orthodoxy that occurred due to Al-Ghazali’s influence during the 11th century – could also be incorporated into this celebrated legacy, as doing so would show many Muslims that their own cultural history offers a way out of the quagmire of fanatical intolerance. New cultural monuments should emerge, inspired by the achievements of the past but also embodying an aspiration toward a better future. The legacy of the Enlightenment, in particular, could by itself create an exquisitely sophisticated, cosmopolitan, and proudly assertive cultural manifestation that would have far more to recommend itself than an orthodoxy based on a seventh-century creed ill-adapted to a hyper-pluralistic world of accelerating technological progress. The murder of human beings for the expression of ideas draws humankind back into the muck of barbarism. It has no place in the twenty-first century, and no part of the world can claim itself to be civilized unless it decisively resists and neutralizes such threats to free speech. The threats, however, have metastasized beyond the individuals who carry them out. A major reassertion of the universal human values of the Enlightenment must happen in order to defuse the hostile environment in which these threats incubate. All decent human beings everywhere are welcome to take part in the revival of these values. Perhaps one day all of us can once more raise our eyes to the stars, without the fear of descending into the quagmire of savagery in which humans murdered each other over disagreements for vast stretches of history, until the Enlightenment raised some of us out. Gennady Stolyarov II is a science fiction novelist and philosophical essayist, and is Editor-in-Chief of The Rational Argumentator. He lives in Carson City, Nevada.